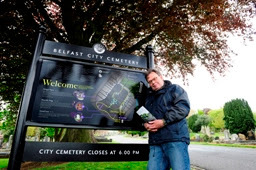 A number of signs have been erected at key points around Belfast`s City cemetery, not only to help people to find their way around but also to map out a new maritime and industrial heritage trail, which identifies some of the more significant memorials located there. Among the many famous people from Belfast`s past interred in the cemetery are the likes of William Pirrie, Chairman of Harland & Wolff; Thomas Gallaher, the `Tobacco King` and founder of the Gallaher`s tobacco factory; Dr Thomas Andrews, the chemist whose pioneering work led to the development of modern refrigeration; the pioneering educational Margaret Byers; the famed Victorian photographer Alexander Hogg, and many more. All of these graves, and other points of interest, are highlighted on the trail, which has been developed and funded by Belfast City Council and the Northern Ireland Tourist Board. Burial records dating back to 1869, and including records for those interred in the Jewish, public and Glenalina extension sections, can be searched via Belfast City Council's online facility. Images are available for purchase (£1.50) for records that are over 75 years old.